Local Troupe Reinvents Bawdy ?Operetta for the Small Stage? A staggering-drunk puppet haltingly navigates his way through a lavish party thrown by a local dignitary. He punctuates nearly all conversations with pointed sexual come-ons to any woman within earshot, but finds his usually dependable lady-killer techniques hampered by frequent drink spills - or perhaps by the prospect of the prison term that awaits him. Meanwhile, his wife - weary of his philandering - plans an elaborate revenge, or at least as elaborate as a 4-foot stage will allow. Despite its similarities to a hallucination, this scene is not the product of excessive indulgence in tequila: It's a wildly unique interpretation of the comic operetta Die Fledermaus by Burlington's own Viva La Voce Puppet Opera. A combination of just a few vocal performances, a stripped-down version of the libretto and some inspired puppeteering, this adaptation might be seen as a deliberate poke in the eye to anyone who reveres more faithful operatic interpretation. To Roxanne Vought, who founded the company a year and a half ago, that is precisely the point. "I've always felt that classical music and opera has been consistently intimidating to people," she offers from the company's Howard Street rehearsal studio, in preparation for the FlynnSpace show this weekend. "I wanted to find a way to make this amazing music and these wonderful stories accessible to anyone, even newcomers . . . particularly newcomers." A few minutes with Vought - a University of Vermont graduate with a major in vocal performance - is enough to convey the seriousness of her comic mission. She is, after all, a veteran of the puppet-opera format - Viva La Voce staged Faust and Carmen prior to tackling this classic German work, whose music was penned by waltz king Johann Strauss II. The operetta's story describes Baron von Eisenstein's habitual infidelities and the growing unhappiness of his wife Rosalinde. It also throws in a little class warfare. This is not the stuff of kiddie puppet shows. 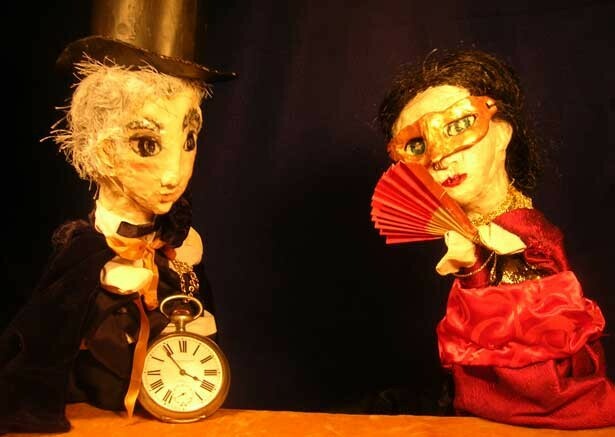 Vought believes puppets are as alluring to adults as they are to children. In fact, it's precisely because her cast uses them instead of human actors that they're so adept at making serious-sounding material wonderfully crazy. How will audiences swallow the concept of a deeply troubled and randy man - made of wood and cloth? "For me, it's less about puppets being cute and more about creating a fantasy world that you can play with as an audience member," Vought says. "It's nice to be able to take the purely human expectations away from a character. It frees up the story a little more, and I think it helps tweak the imagination of anyone watching." Not satisfied with Viva La Voce's schedule of one or two performances a year, Vought plans - with the help of grant money - to expand both the range of material and the frequency of shows. She's quick to tie that ambition in to the greater goal of sowing seeds of interest in opera. "Sure, one aspect of founding [Viva La Voce] was to play with a format that might strike people as novel," Vought adds. "But, more broadly, it is a way of passing music history down to a new generation. If puppet opera helps make that history seem more accessible, then I'm overjoyed."